Now that we know how to log users in using Facebook or Google OAuth let’s build a comments component. It’ll show existing comments, and allow users to submit new comments. Node.js backend. Authenticates users via Facebook or Google OAuth and stores users their comments in MongoDB database. React Native mobile app. Has Login and Comments screens. The former is to log users in, and the latter is to show user comments and to post new ones. Let’s start off by pulling the code from Logging Into React Native Apps with Facebook or Google tutorial to use it as a boilerplate and build on top of it. 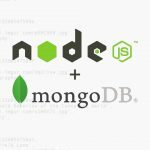 First, let’s modify our backend code so that it can handle user and comment creation using MongoDB. Now, let’s create Mongoose models for users and comments. We’ll use those to store users and comments in MongoDB. Create a new folder called models within backed folder. Create a new file called user.js within models folder. Create a new file called comment.js within models folder. Currently, we have all of the authorization logic in one file server.js. But since our app is getting bigger and we’re adding comments it would be better to break the code down into different controllers to divide responsibilities. Generally, it’s a good idea to follow Single Responsibility Principle. The single responsibility principle is a computer programming principle that states that every module or class should have responsibility over a single part of the functionality provided by the software, and that responsibility should be entirely encapsulated by the class. – Wikipedia. Create a new folder called controllers within backed folder. Let’s move all authorization logic from server.js to auth.js controller. Create a new file called auth.js within controllers folder. Now, let’s create comments.js controller with two actions: list and create. list returns all existing comments from the database, and create adds new comments. Create a new file called comments.js within controllers folder. In the next step let’s update server.js to import controller actions that we just created and register the routes. Open server.js file and replace its content with the following. We’re done making changes to the backend. Let’s launch it to make sure it still works. You should see a confirmation that it’s running in your terminal. Now, let’s open a browser and go to http://127.0.0.1:3000/comments. 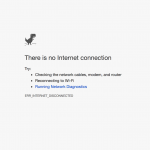 There are no comments yet, but the server works, which is great. Keep it running and let’s work on the mobile app. Now that we’re done with the backend let’s go ahead and make use of it and build a mobile app! Install moment that’ll help us out with formatting date times in comments. Since, again, our app is getting bigger and more complicated let’s break everything down into different components. And start off by moving all of the login logic from app.js to its own component called Login. Create a new folder called components. Create a new file called login.js within components folder. Before we get started building comment components, let’s create a couple of helper functions that will help us make API calls. Create a new file called api.js within project root folder. For now, we just need to make GET and PUT calls to fetch or post new comments. If you decided to add a comment deletion feature, you could easily add new delete function. List. 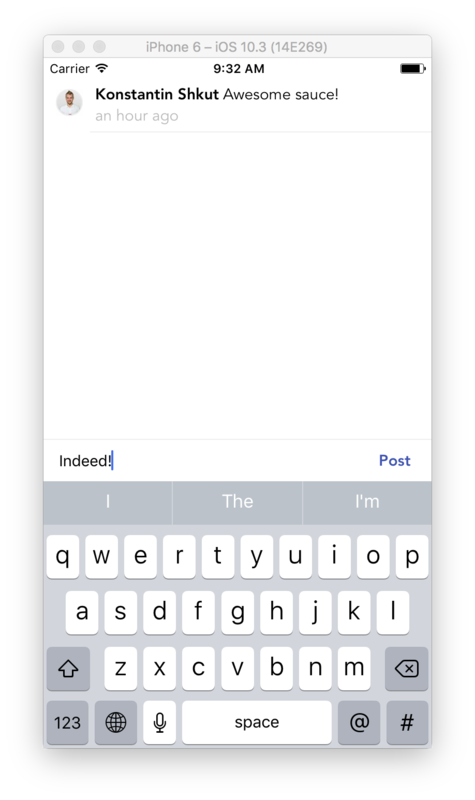 Renders a scrollable list of comments and an input field for posting new comments using Comment and Input components respectively. Comment. Renders a single comment with an avatar, user name, content and how long ago it was posted. Input. Renders an input field for posting new comments. Create a new folder called comments within components folder. 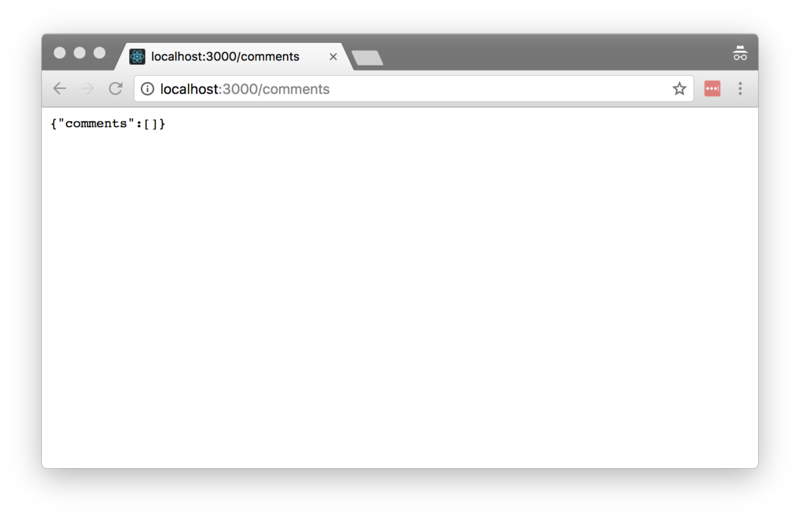 First, let’s create Comment component that renders each component. Create a new file called comment.js within comments folder. It’s a pretty basic component that takes in comment object as a prop and renders user’s avatar, name, their comment and how long ago it was posted. Next, let’s build Input component that allows users to post new comments. Create a new file called input.js within comments folder. This component has an input field that takes users input and passes that input to onSubmit function passed as a prop when they press Post button. Finally, let’s make use of two components we just build in previous steps. Create a new file called list.js within comments folder. This component makes an API call to fetch existing comments when being loaded for the first time. Then it renders a scrollable list with comments rendered as Comment components and an input field rendered by Input component. It also allows users to refresh comments by pulling down the list. And in the final step let’s update App component to use our new Login and Comments components. Open app.js within project root folder. And we’re all done. Let’s launch our app to make sure that everything is working as expected. Make sure our Node.js backend is still up and running. Launch the mobile app by executing react-native run-ios in the terminal. Hopefully, you’ve learned a lot and will be able to use that knowledge when building your apps! Subscribe to get notified about new tutorials. And if you have any questions or ideas for new tutorials, just leave a comment below the post. Sign up to be notified of new blog posts and be the first to receive helpful goodies! know what happend with this? thanks! Thank you for posting the valuable information about the Node JS Blogs .And every people easily understand about your posting, and I am learning a lot of things from your posts,Keep it up. It’s very informative article about Implementing Comments with React Native and Node.js. Thank you so much for this great content. If we take Node JS Training then we can improve our skills on Node JS technologies.